MELISMATIC: [WGO] This I Not A Drill: BEP Goes "Down". [WGO] This I Not A Drill: BEP Goes "Down". My dear friends in American Hot 100 chart watching, it's time to wake up. We have a new number one in the United States. After 14 weeks of the Black Eyed Peas' David Guetta-produced "I Gotta Feeling" (and 12 more of BEP's "Boom Boom Pow" before that), we finally have a major change-up in the Hot 100 Top Ten. So who's the lucky duck who finally managed to push "I Gotta Feeling" to not #2, not #3, but #5? Miley Cyrus? Jay-Z? Lady Gaga? In other surprise news, Babs Streisand and her new record Love Is the Answer managed to best the new Paramore and Mariah Carey records, which landed at #2 and #3 respectively on this week's Billboard Top 200 Album Chart. Guess this week is chock full of surprises, eh? 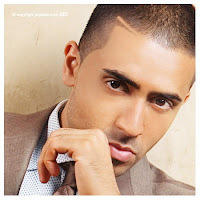 I'm kind of in love with Jay Sean's "Stolen" (especially the chorus and post-chorus). Can he release that as his next single, even if it is five years old?